Help us to clear our over-stocks! 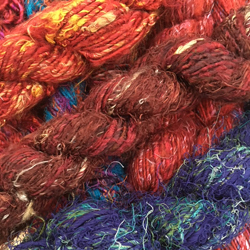 This beautiful filament silk and banana fibre yarn has been hand-dyed to the most vibrant shades. The yarn feels lovely and soft and will add an element of luxury to any project. 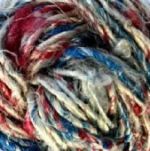 This is an excellent yarn for all types of creative textile projects requiring rich, deep colour including knitting and crochet, weaving, braids and tassels and embellishment within quilts, patchwork and embroidery. As it has no "give" it is especially suited to knitting items such as scarves, hats, mittens, bags, waistcoats and jackets, and is also great for cushion covers. Unlike the yarns spun from recycled fabrics, this yarn has a more even texture and is actually dyed in batches. At the moment we have good stocks of all colours, enough to order sufficient for a project. 18st and 20 rows to 10cms on 4.5mm needles Hand wash, pull into shape, dry flat if possible. Every skein will be a different length, but they are likely to be around 28 metres - they could be more or less.